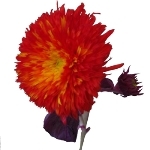 A fresh red tinted flower, this Teddy Bear Sunflower has numerous ray like petals, but no center. Known for following the sun across the sky, the sunflower has come to mean “adoration” and “loyalty.” A perfect flower for outdoor events, this unique red tinted Teddy Bear Sunflower would add a stylish informal touch to any wedding bouquet, table centerpiece or flower arrangement. Our Sunflower is shipped fresh directly from our Ecuadorian farms to your doorstep. Order online and pay wholesale prices, plus receive free shipping! These sunflowers are tinted. The tint will NOT rub off of the petals; however, the color may seep where stems are cut or leaves are torn from the stem, especially when wet. Temporarily stains hands, so wear gloves. May stain clothing. The color of this tinted product may vary to some degree. Flower react differently to tints. Some petals may not absorb the tint 100% and the color may be darker on some petals than on others. Also, the tint may affect the color of the veins and leaves. The natural center for this particular flower is a yellow green color. The tint may the center color. 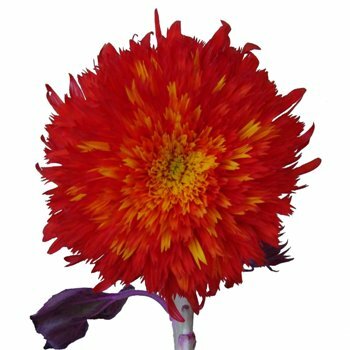 Red Tinted Teddy Bear Sunflowers have an average minimum bloom size of 3 inches in diameter.